That water belt will come in handy for warm-weather runs. Just over a year ago, my dad, after hearing I had entered my second half marathon, signed up to run 13.1 miles down in Phoenix with me. He trained during hunting season, he trained on the hill by his house and he trained on the treadmill in his workout room. And then he beat me by seven minutes. In my defense, I DID train in Vibrams and wore shoes so beat up that I got blisters, but still…my dad beat me. And in doing so he ignited a long-dormat running passion that I haven’t seen since I was about five. He runs for fun now. 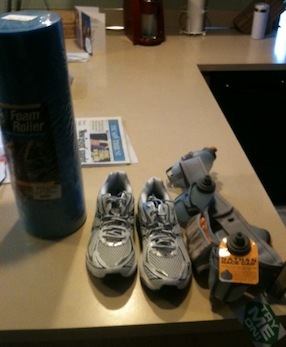 He bought a real runner’s water belt and a foam roller. Three half marathons later, he’s already planning on running a fourth this spring. That will make four 13.1 mile races AFTER he turned 60. That’s impressive for someone of any age. And no, I haven’t beat him yet.